Welcome to the subscriber section of Smart Student Secrets. This is the section where I’m going to share exclusive content for regular readers of this blog. I’m going to be providing advice (the kind your parents and teachers won’t tell you) about how you can turn your mediocre grades into amazing grades faster and easier than ever before. So… what’s this new members area all about? Since starting this blog I’ve been forced to balance my content between new blog readers and old blog readers. The reality is that good grades are easy to get when you know what you’re doing. The sad part of that is that most students don’t have a clue what they’re doing. There is a bit of a learning curve to the process. Moving from a bad study routine to a good study routine is easy. Moving from a good study routine to a more advanced routine can get complicated. If I share advanced advice with a new reader then, odds are, I’m just going to end up confusing them. I’m getting messages about that all the time. The thing is, I have the opposite problem too. When I attempt to cater to new readers by offering a full overview of the information my regular readers send me messages looking for more new and advanced stuff. This section is my attempted solution. 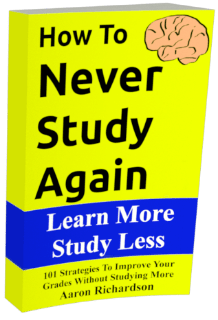 In this section I’m going to provide the details that can really turn a good study routine into a top of the class study routine. As a subscriber, expect regular notifications of the new stuff we add to the members area and the regular blog. You also have first dibs on most Q/A’s. Subscribers questions get answered first. We’d love to hear your questions. Not only that though. We’d love to hear your thoughts too. We’re always looking for awesome study strategies, new study bloggers, and great stories to learn from. Have something to say? Then we’d love to hear it. Also, we love requests for content. If you have any awesome ideas then we’d love to work with you on them.